This Autoimmune Disease Diet is found in the book, The Immune System Recovery Plan. It was created by Susan Blum, MD, an assistant clinical professor who serves on the Medical Advisory Board for The Dr. Oz Show. This plan involves a four-step program for overcoming autoimmune disease by using food as medicine. Your joints ache or swell for no apparent reason. You experience unexplained weight fluctuation. You feel hot when everyone else feels cold, or vice versa. You have dry hair or skin problems. You generally don’t feel your best. Autoimmune disease occurs when the immune cells of your body make a mistake and attack your own cells, tissues and organs. They release antibodies and irritating chemicals resulting in damage and inflammation at the area where this is occurring. Symptoms of autoimmune conditions can vary depending on what part of the body is affected. Some people experience general aches, pains and fatigue without knowing the reason why. What all of these diseases have in common is an underlying dysfunction of the immune system. This autoimmune disease diet uses lifestyle modification to positively influence body functions on a deep cellular level. When this occurs the body starts to function properly, which can alleviate symptoms and reverse disease. Dr. Blum focuses on identifying and treating the real cause of symptoms including diet, lifestyle and exposure to toxins. Nutritional medicine is the cornerstone of her approach. This means using food as medicine to reduce inflammation, heal the immune system, remove toxins and generally restore balance. The autoimmune disease diet incorporates four steps, which each target a specific aspect of healing and preventing autoimmune disease. To get the best results you should complete the four steps in order. However, each can stand alone, so if you prefer you may choose to focus on one part at a time. Each section comes with an interactive workbook to help you create your own personal treatment plan. There is also a selection of simple recipes that are designed to facilitate the healing process for each stage of the program. Tempeh, black beans, lentils, mung beans, eggs, salmon, organic chicken, quinoa, basmati rice, flaxseeds, bok choy, kale, broccoli, spinach, mushrooms, sweet potatoes, avocado, mango, banana, raspberries, blueberries, coconut milk, ginger, extra-virgin olive oil, ghee. The autoimmune disease diet believes that exercise has a positive effect on your adrenal glands and the cells of your immune system. If you are experiencing extreme fatigue you can wait until your condition improves before introducing exercise into your program. When you are ready to get moving, walking is a good activity to start with. You should aim for at least two hours a week of moderate activity. It is also beneficial to incorporate weight-bearing exercise and yoga into your fitness regime. 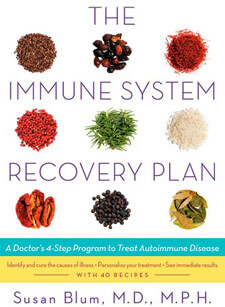 The Immune System Recovery Plan: A Doctor’s 4-Step Program to Treat Autoimmune Disease retails at $27.99. Offers a drug-free approach for the treatment of autoimmune diseases. Addresses the role of stress management for achieving balanced health. Can help you identify the foods that are causing immune reactions and inflammation in your body. Helps to rebalance intestinal flora and heal the gastrointestinal system. The autoimmune disease diet supports the function of the liver to enhance elimination of toxins. The meal plan is quite restrictive and eliminates a wide variety of foods. Some parts of the program require the use of nutritional supplements. The autoimmune disease diet recipes do not include nutritional information. The Immune System Recovery Plan is a four-step autoimmune disease diet for overcoming autoimmune conditions with diet and lifestyle modification. This protocol provides a solution for managing these diseases through promoting optimal body function by using food as medicine. Blum, Susan S., and Michele Bender. The immune system recovery plan : a doctor’s 4-step program to treat autoimmune disease. New York, NY: Scribner, 2013. Print. I am a healthy, active 57 year old that bikes, runs, eats well and takes Juice Plus. I have granuloma annulare and have had it since I was a youngster. About 10 years ago I was diagnosed with Graves’ disease and had my thyroid destroyed. The granuloma annulare is popping out in more places. I’m using cream to get rid of it but … it keeps appearing in new places and has never gone away on my feet. Is this book a good place to get my immune system back in order and hopefully get rid of these bumps?